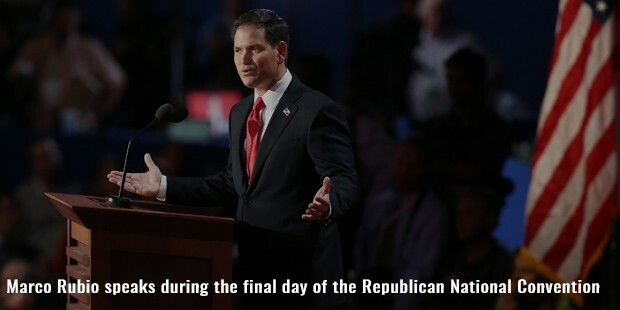 Marco Rubio is the junior United States Senator from Florida. 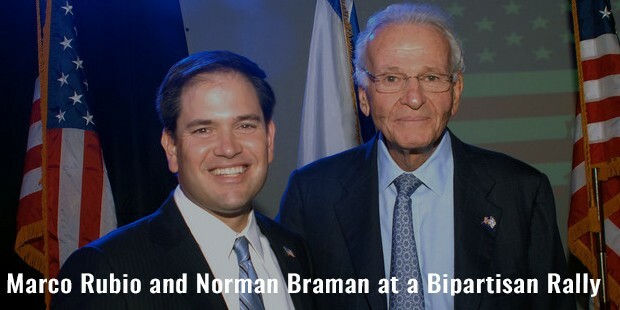 He has been serving as the Senator since 2011 and is a candidate for President of United States. He has previously served as the Speaker of the Florida House of Representatives. In 2000 he was elected to the Florida House of Representatives after serving as the City Commissioner for West Miami. Rubio announced a run for U.S Senate in 2009 followed by a win in the Republican nomination. Rubio was born to Mario Rubio Reina and Oriales Rubio. 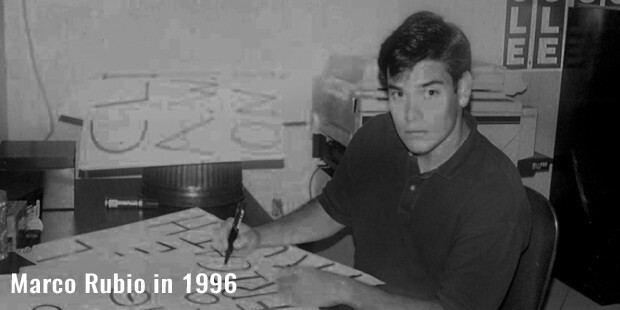 Rubio attended the Tarkio College for a year on football scholarship from 1989-1990. He earned a BA degree in Political Science in 1993. While studying law from University of Miami School of Law, he interned for U.S Representative Ileana Ros-Lehtinen. He served as a City Commissioner for West Miami and also on the 1996 Presidential Campaign of Republican Senator Bob Dylan. 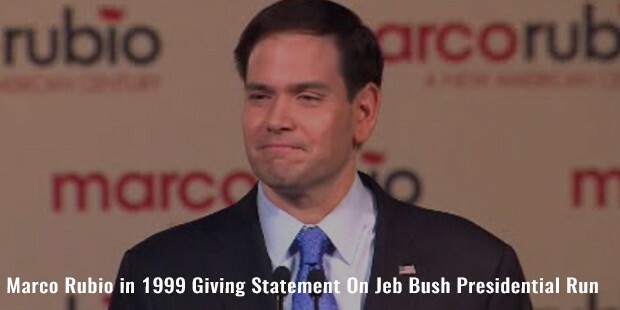 In 1999, Rubio was placed second in the Republican Party but won the run-off election for the Republican nomination and defeated Democrat Anastasia Garcia in 2000. In 2000, 2002, 2004 and 2006 he won re-election unopposed. Rubio was appointed as House Majority Leader by Speaker in 2002. In 2005, Rubio became the first Cuban American to become Speaker of the Florida House of Representatives. In 2009 he announced on his website that he plans to run for the United States Senate seat. Rubio eventually surpassed Crist and won the Republican nomination for the Senate. In 2010, Rubio won the general election and soon became the subject of speculation as a potential candidate for the 2012 presidential election. 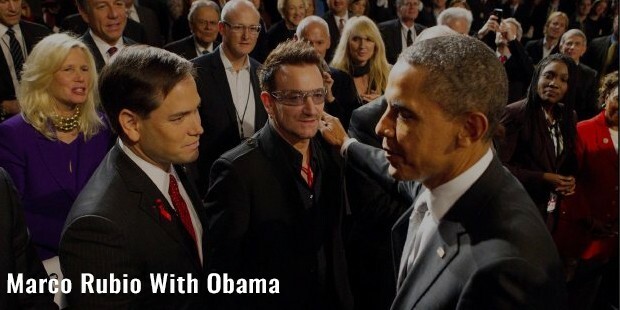 Rubio plans to run for President in the elections in 2016. In 2015 it was reported that Rubio had begun contacting donors and appointing advisors for the 2016 run. In 2007, Rubio advocated a plan that would roll back property taxes in the state and potentially eliminate them altogether. Rubio voted against the Budget Control Act of 2011 which included budget cuts. In 2012, he introduced a bill co-sponsored by Joe Manchin to allow employers to be exempted from newly mandated coverage for contraception based on religious or moral grounds. 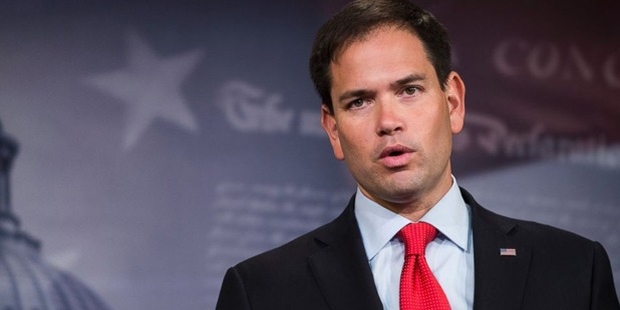 In 2013, Rubio voted against an expansion of background checks for gun purchases. Rubio has taught political science course at Florida International University during his U.S Senate Career. In April 2015 Rubio announced that he will run for President of United States in 2016. Rubio met Jeanette Dousdebes when he was 19 years old in a neighborhood party. They have been together ever since. Dousdebes was a cheerleader for Miami Dolphins and was in their first Swimsuit Calendar. 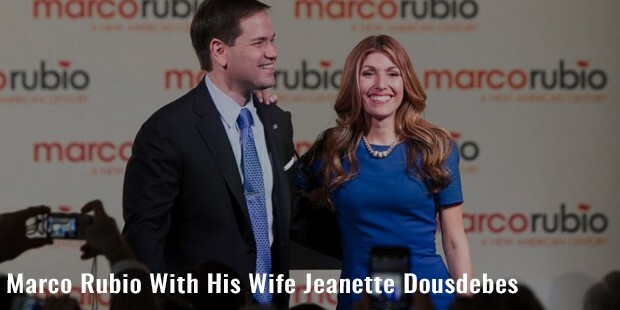 Rubio and Dousdebes married in 1998 and have four children together. Jeanette Rubio works part-time for a Charitable Foundation; Barman Family Foundation. Rubio started his own law firm after leaving the Florida House of Representatives. Rubio has authored the book 100 Innovative Ideas for Florida’s Future in 2006. He has also written American Dreams: Restoring Economic Opportunity for Everyone in 2015.